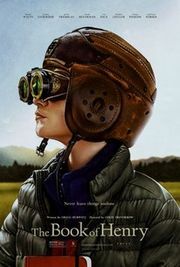 Book of Henry is not everyone's "cup of tea". Basically, a precocious genius Henry (and his younger brother, Peter) are being raised by their perpetually self-absorbed and immature Mom (Susan), when Henry witnesses the symptoms of abuse, he decides that since the system is broken and unjust, that he'll create some of his own justice, and sets in motion his rube goldberg perfect crime. Being that I was a genius kid (who held myself back in school because I too felt that socialization with kids my own age was more important that "academic accomplishments" as measured by a system that I felt wasn't very fair or wise), and I also had a somewhat self-absorbed Mom, was on the receiving side of abuse (and so had an over-developed sense of justice): thusI could relate to the teasers on this movie. While is was getting only 25% approval from reviewers, it was getting 71% by audiences (and I tend to associate more with audiences than reviewers): so I went to see it. It was interesting. I liked it more than most will, but that still puts it as barely better than half the movies I'll see this year. And that, only because it was at least somewhat original, despite how hackneyed everything felt. The teasers play it more as a caper heist, or high drama and some such -- but everything felt pieced together from many other stories. And I was into it to see how they played Henry --and his character was too ham-handed. They didn't have the time to play out the nuances they should have -- that genius kids aren't geniuses in everything, that they can be off the hook smarter than their contemporaries, while still being childish and total fuckups in other areas of their life. So while it was reasonably acted (I thought all the characters played their parts well -- even Sarah Silverman, who normally has the same appeal to me as licking a dirty chalkboard), I felt like the story line had a lot of potential (in the big picture), but something about the dialog and actions just fell a little flat. In the end, I liked the movie more than most reviewers, and flipped almost completely on why. While I agree that the tone didn't quite work, when you realize the movie isn't about Henry but Susan (his Mom played by Naomi Watts) and Henry's brother (Peter), it becomes a much better film, and I was quite happy with the ending. Though it was a bit all over the place -- and it definitely went places you didn't expect while still managing to be too cliché at the same time. To me, it came off as a somewhat darker film, with reasonable messages, and good to mediocre overall -- with hints that it could have been a much better film, even if I can't figure out the recipe for making it that myself. And I know that most other people would find it far less appealing than I did. This page was last edited on 18 June 2017, at 22:48.